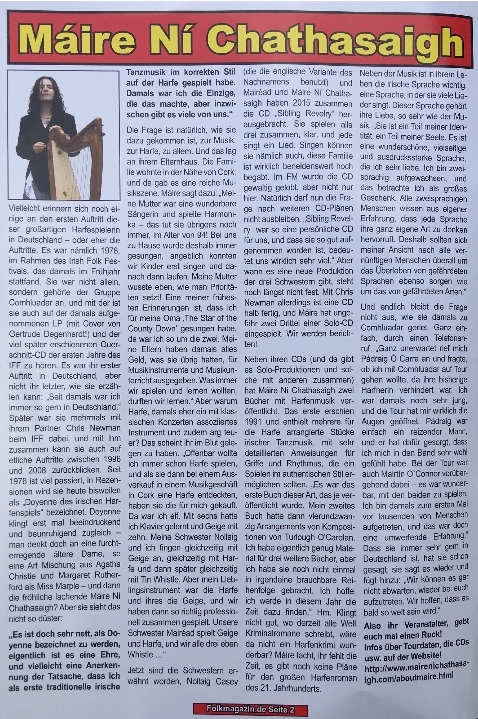 Interview with Máire in The Herald Scotland on 8 April, 2015, prior to her Edinburgh Harp Festival performance with Chris. Interview with the Bunbury Mail (WA) about the quartet's tour of Australia. 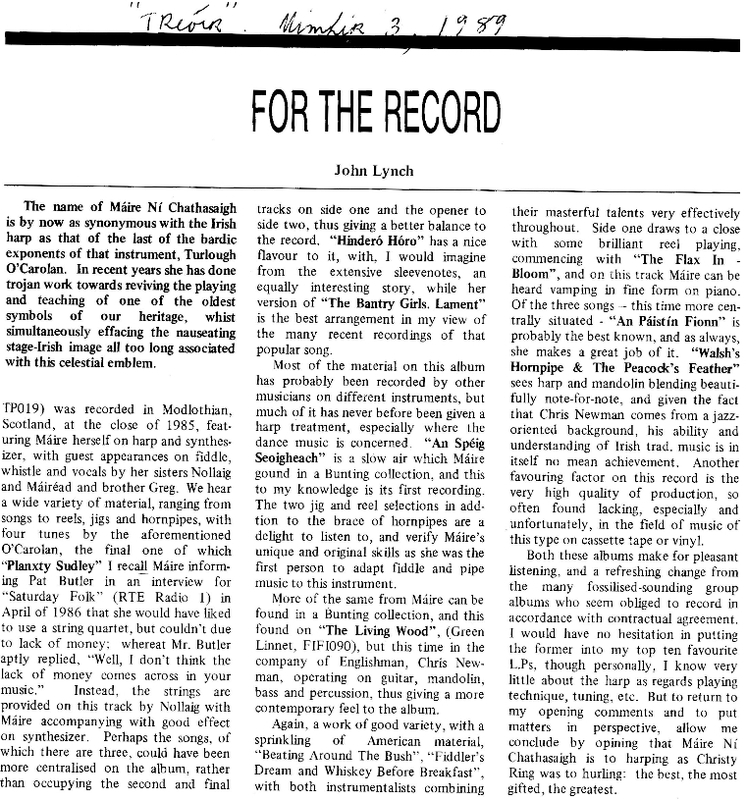 Below you can also find copies of further press features and interviews with Chris and Máire over the years, which we're posting gradually as we get around to clearing out old boxes of memorabilia and scanning the contents. We're grateful to Máire's mother Úna for keeping the newspaper cuttings! 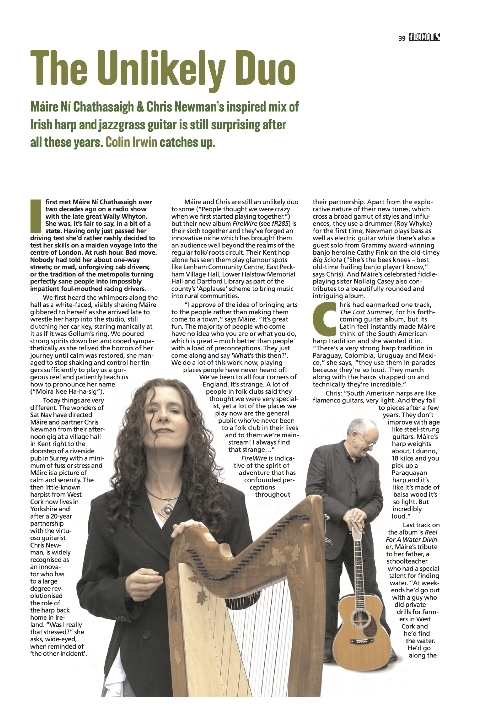 When I first heard Chris Newman play the guitar in a concert with his musical partner, Irish harpist Máire Ní Chathasaigh, about two years ago I was stunned. He moved around the fingerboard with tremendous fluidity and ease. He played phrases that were totally foreign to my ear, and thus extremely captivating. I remember, in my guitar player's brain, watching him play and thinking how complex his playing seemed. I was thinking, 'I would never be able to do that!' Yet, at the same time there was such simplicity, elegance, and tastefulness to the music he was making that it boggled my mind. Chris is one of those rare players that have a very high degree of technical skill and proficiency, yet remain extremely musical and tasteful. Raised in the North of England, Yorkshire, it was sibling rivalry that brought Chris his first guitar when he was just five years old. He recalls, "I have a brother who is ten years older than me. In the 50s he was into Buddy Holly and skiffle, which was a big thing in England at the time. He got a guitar for his birthday. His birthday is in September and mine is in October. After he got this guitar, I badgered my parents and said, 'I want one, I want one.' I got a little guitar, that I still remember quite well." Initially Chris learned everything 'second hand' from his brother. Both he and his brother were playing nylon string acoustic guitars. Chris said, "He was always into acoustic stuff. Neither one of us have either been into electric stuff that much. He was old enough to go to the folk clubs, so he would go there and come back with all of the things that he had sort of memorized. And then I would learn them off of him." Other than a very short 'electric phase' when he was 16 or 17 years old, Chris has always played the acoustic guitar. When Chris first started he learned to play fingerstyle with his thumb and three fingers (no finger picks). But he says, "I was also sort of playing a flatpick style, but without a flatpick. I would put my thumb behind my index finger and I used the nail of my index finger to pick with. But I was always breaking my nail, even on nylon stringed guitars. It wasn't until I was about 15 years old that a friend at school said, 'You know I think you can get a thing that you can hold.' I didn't know. That weekend I went to the music store and they had this big tray of plectrums. I bought one of those and I have not put it down since. I hardly ever play fingerstyle now." When asked about his early influences, Chris said, "I remember that there were two records that I got that I sat down and completely ripped off. One was by a guy named Davey Graham and it was an album called Folk, Blues and Beyond. Bearing in mind when it was made, it is just a fantastic record. I still have it. I remember listening to that and saying 'Wow, this is it!' The other record was Down Home by Chet Atkins, which my sister bought me for my tenth birthday." In addition to learning the fingerstyle licks on these two albums, Chris said that he was a huge Beatles fan. He remembers, "The new Beatles records were always released on a Friday. I'd save up my pocket money, buy the record on Saturday, and have learned the tunes by Sunday. That is what I used to do. So, a lot of the guitar solos that I learned on my nylon string guitar using my index fingernail as a flatpick were George Harrison solos from Beatles records." A little while after learning how to play with an actual pick, Chris got his first steel string guitar. He said, "That made a big difference. And it wasn't too far after that that I heard Clarence White. I heard him on a record and I didn't have any idea who he was. I was playing with a band, actually, and we were playing in this nightclub in the north of England. They decided that they were going to put on acoustic bands every once in a while. I was playing with this group and the DJ there, rather than playing a rock and roll track at the end of the night put on this acoustic record that someone had given him. It was actually Don't Give Up Your Day Job. The song he played was Huckleberry Hornpipe. I remember it like it was yesterday. I was packing up the gear and I suddenly heard this fiddle playing. I thought 'Well, that is nice.' Then all of the sudden came Clarence's solo. I thought 'What on earth is this!' I had never heard anything like it in my life. I went over to the DJ and said 'What is that?' He said, 'It's this thing here' and he actually gave me the record. I still have it." Chris took the record home and started learning Clarence White solos, starting with Huckleberry Hornpipe. He played the recording for a friend of his who he knew had a great record collection. His friend was not only familiar with Clarence, but had several Kentucky Colonels recordings. He also told Chris that he ought to listen 'to this guy called Doc Watson.' Chris said, "I though this was fantastic. There was something going on in America that I ought to know about! My friend said, 'Well, while your at it...' and he started pulling out records by Norman Blake and all these people that I had never heard of. It was amazing. He made me a load of cassettes and for ages I would listen to these tapes and it was always something stupendous. I heard the Clarence White recording and thought, 'this guy is really one off.' Then I found out that there really were a ton of these guys out there and that it was quite a thing [laughs]." Chris has never 'had a real job,' having always made his living playing the guitar. When asked about the kind of music that he has played, he said, "It has been a variety with a capital V." He has done everything from folk, blues, jazz, swing, to commercial music. He has backed up everyone from commercial singers, to comedians, to Celtic performers, to bluegrass fiddler Richard Greene and played in small clubs to huge theaters. Although Chris achieved a great deal of success playing the guitar professionally during the early part of his career, in about 1985 he reach a point where he decided 'he'd rather play interesting music than pursue interesting pay checks.' 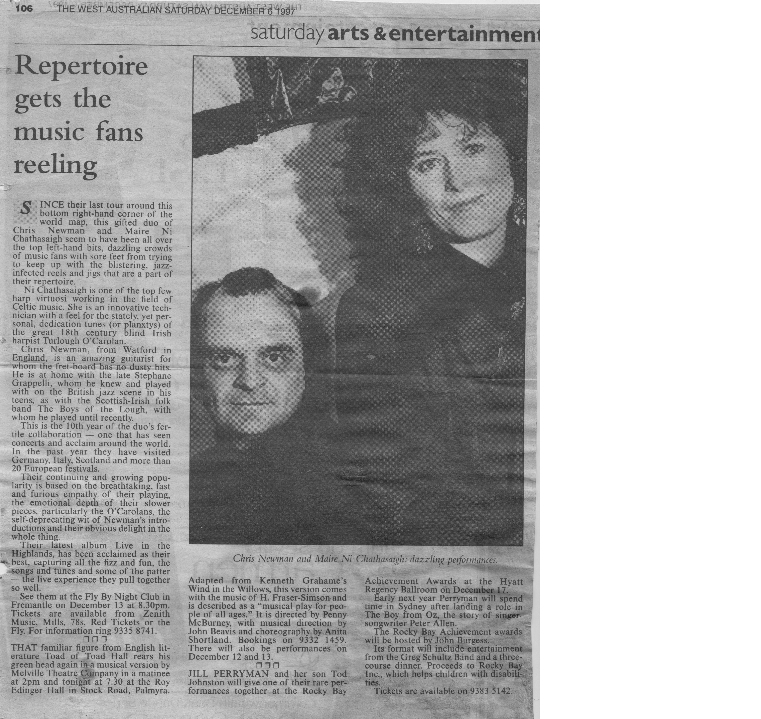 He immersed himself in traditional Irish and Scottish music and began touring with Irish harpist Máire Ní Chathasaigh in 1988. Chris said that he discovered Celtic music in very much the same way he discovered Clarence White and bluegrass. He remembers, "I was playing in a bar in Belgium in the seventies and during the break a guy put on a record on the house system and it was this fantastic music. It was an Irish band called Planxty. It was the first time I'd heard Irish music played in that way. I went on and bought the records and started playing the tunes. So, I'd been playing Irish music along with the records, but never playing out. When I started with Máire it involved an enormous amount of work for me to get the style nailed. There is nothing particularly complicated about the tunes, but all of the triplets and ornaments are tough to get right. It is question of feeling your way. You have to know where to put the triplets, cuts, and rolls to give it the right feel. It is really a bit of a minefield." When Chris and Máire first began working together, they started with her repertoire. She made a tape, and Chris learned the tunes. 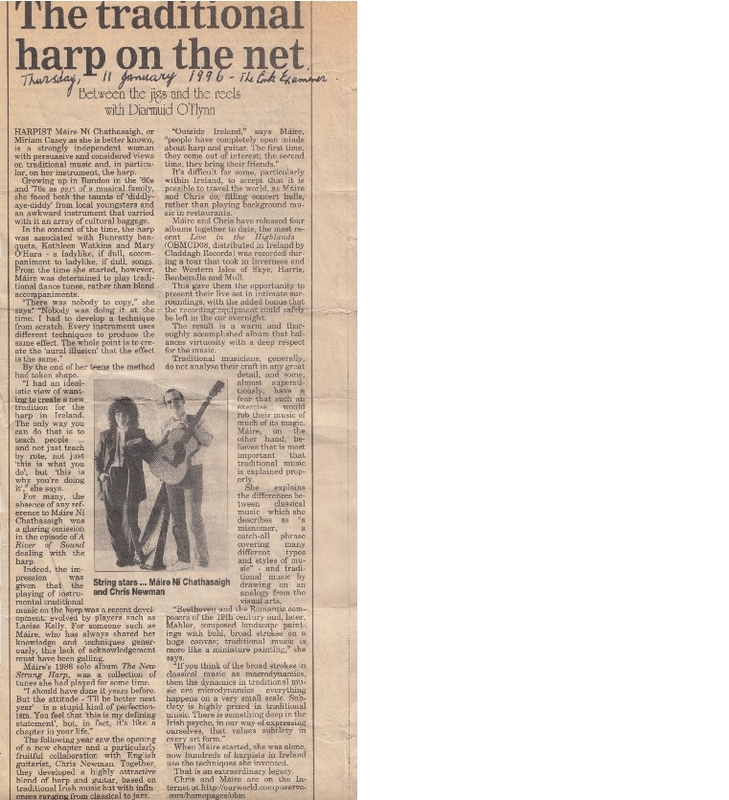 He says that he listened to the tape over and over and over and learned how to adapt her harp tunes to the guitar. Since then he says that they later began to incorporate other kinds of music, like swing jazz, that made her work a bit harder to adapt to the harp. Today Chris and Máire's repertoire incorporates a wide variety of music from swing, to bluegrass, to Irish and Scottish music. They continue to tour extensively in both Europe and the United States." 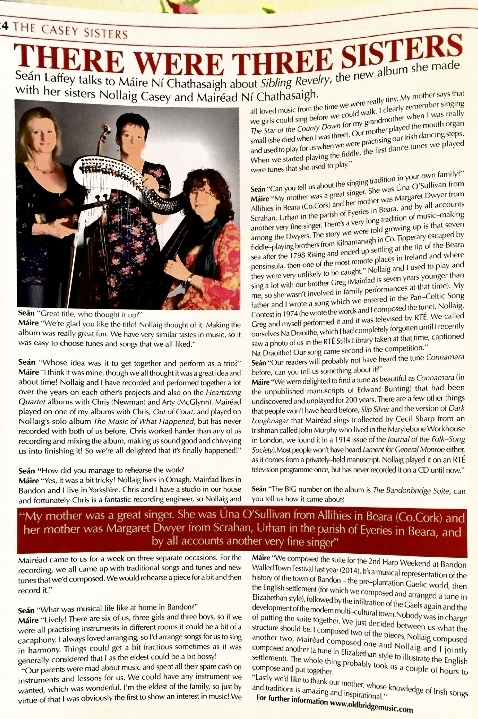 "Because Chris did not start out his musical career playing Irish music, and because he had such a wide and diverse background prior to playing Irish music, Flatpicking Guitar Magazine conducted the following interview with Chris regarding the technical aspects of learning Irish music on guitar. FGM: What would you recommend to flatpickers who wanted to incorporate more Irish music into their playing style? CN: To be honest, the first thing you do is just listen, and don't try to listen to just guitar players because there aren't that many. Listen to flute players, fiddle players, and harp players. The next thing they could do is to enrol in some kind of summer school like the Milwaukee Irish Fest Summer School or the Gaelic Roots at Boston College. FGM: I know that you have taught at these schools yourself. What kind of things do you teach and what kind of players do you find are attending your classes? CN: I had a half a dozen people in my group and they were all intermediate to advanced players. They were all pretty decent players, playing with flatpicks and coming from the bluegrass end of things. They wanted to learn how to apply what they do into the Irish/Scottish context. We spent a lot of time working on the rhythm and working to learn where you should put the triplet and where you shouldn't put it. FGM: Do you find that people coming from a bluegrass context have trouble getting into the rhythm of Irish music? CN: They very often have trouble with jigs. Reels are similar to something like Blackberry Blossom so they don't usually have trouble with reels. But when you get them started on 6/8 tunes or 9/8 tunes they have a lot of trouble just getting their head around the idea. It is just a different thing. FGM: Is there a way that you have found that helps students overcome that difficulty? CN: Just simply by example. Just getting them playing it. Sooner or later the penny drops. You see people struggling and trying really hard and all of the sudden it is like "Ahh!" Once you get the rhythm right with the right hand, when it comes to playing the tunes it actually becomes easy and where you put all the ornaments will become more evident if you have got the rhythm right in the first place. If you try and learn the tunes with all of the ornaments before you get the rhythm right, you are banging your head against a wall. fGM: Do you spend time in the workshops watching the students play and then offering some suggestions regarding their technique? CN: Absolutely. If you have 25 people in a group it is harder to do that. But I will try to do it whenever I can. FGM: Tell us about your instructional book. CN: There are a lot of technical exercises in there. It is aimed at the intermediate to advanced level student. The exercises have the dots and tab and under the tab I also included the fingerings. That is the thing that took me the most time, but it was important because a lot of these tunes, especially the Scottish tunes, have got fantastic jumps, like three octave arpeggios. If you finger them properly, they are not particularly difficult, but if you don't finger them properly you've got no chance at all. FGM: Is the book all Irish and Scottish music? CN: No, quite a lot of the tunes I made up myself. It originally started out as an aid to workshops so that I could have some hardcopy to give out to people for the technical stuff. Then someone suggested that I write some tunes out as well. FGM: When you say 'technical stuff,' what are you referring to? CN: Finger exercises, loads and loads of them - mostly left hand positioning things because that is where people generally fall down. I used to work with a guitar player years ago, we did little swing jazz gigs together. He was a really good singer and a decent player. He was a very musical player and had great ideas for solos, but he could never play them because he didn't have the technical facility. It was really sad because I¹d be sitting with him and we'd swap leads and he'd play some solo. You could see where he was going and it was really nice, but then it would just fall down. I used to say to him, "If you would just spend a little bit of time on technique anything you want to play is going to be possible." I don't want you to get the impression that all I am concerned with is technique, but without the basic technique you will do nothing. With this pal of mine it was really sad because it is really easy to teach someone technique, there is nothing magical about it, you basically sit down and just do it and you will improve. But it is almost impossible to teach someone how to be musical. You get people that are fantastic technicians, they can play anything, but they are boring players. It is clean as a whistle, but it is boring. I can think of a million people I've heard like that. This pal of mine was a fantastically musical player, which is the tough bit, but he didn't have the technical ability. I used to say, "You really should do it. It is criminal not to!" He'd say, "Well I can't be bothered with technique" and so he'd stumble away. It is a real shame. FGM: What would you describe as the difference between Irish tunes and Scottish tunes? CN: Not huge actually. There are certain types of tunes, like strathspeys, that appear in Scotland and not in Ireland. It all comes down to the ornamentation. The Irish tunes tend to be more heavily ornamented. But even then, that is a generalization because it depends on which part of Ireland you are talking about. There is a definite difference in say people from Donegal and people from Clare. The further north you get in Ireland, the more like Scottish music it becomes, which is not really surprising. FGM: When you talk about knowing when to use the ornamentation and when not to use the ornamentation, does that come down to an experience and feel thing? CN: Exactly. As far as I'm aware, no one has ever written it down. For me I had a good mentor in Máire because we'd be sitting at home practicing something and she'd say, "No, you can¹t do that!" The first few times I'd say, "Well, why not?" After a while you can sort of just tell when it is right. I would recommend that anyone interested in learning that sort of thing listen to fiddle players and flute players. The other thing I tell people at workshops is that the guitar is fairly new to all this. I mean it is a relatively recent addition. It isn"t a traditional instrument. A guitar player's role in that kind of thing is really as a rhythm instrument first and a harmonic instrument second. I have played with a lot of fiddle players and flute players and I know full well that if a tune is in D, for example, and you start the B part in D or if you start it in Bm and then turn it around different ways depending on where the melody is, the person you are accompanying will not care one hoot. But if you get the rhythm wrong, they will go completely nuts and absolutely hate it. As long as they have that strong rhythm, that is all they are interested in. To evidence this you only have to listen to any recordings made in the 1920s and 1930s by fiddle players like James Morrison or Michel Coleman. They made these incredible fiddle recordings but they were always accompanied by the worst piano player that you have ever heard in your life. But all they wanted behind them was this very percussive 'bash-crash' on the piano. They couldn't care less that the guy was completely playing the wrong chords. You listen to any recordings from that time period and you will find Hapless Harry on the piano! It will just make your teeth ache. FGM: Since there are not too many lead guitar players in Irish and Scottish music, do you find that other musicians will typically want you to stay in a rhythm role when you get together to jam? CN: Absolutely. It is one of the reasons I don't play sessions in pubs and things like that. Sessions in pubs on guitar playing Irish and Scottish music is the most boring job in the world. I've got no objection at all to playing rhythm all night. I actually enjoy doing that. But playing rhythm to eight fiddle players who are all trying to play louder than you, I can't be bothered. I hate all that and avoid it like the plague. But in a good situation with a couple of other musicians, especially if you are the only guitar or only chord player there, is great fun. FGM: In terms of lead guitar work in the Irish music genre, who would you recommend that people listen to? CN: Arty McGlynn is somebody you really ought to listen to because he has been doing it for a long time and he is a terrific player. He really is very good. He has been on a million records. If you have the opportunity to listen to Chris Newman play the guitar live or on CD, you ought to treat yourself to it. He is also a talented instructor. His book of tunes, tips and technical advice Adventures with a Flatpick was published by Old Bridge Music in 2001. 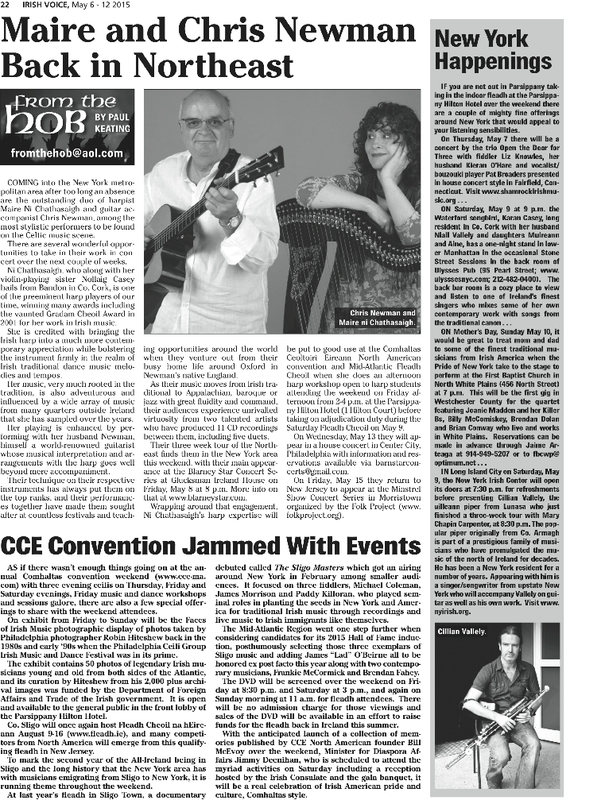 He is principal guitar tutor to Newcastle University's Folk Music degree course and is much in demand at summer schools: within the last couple of years he has been a guitar instructor at Steve Kaufman's Flatpicking Kamp in Maryville, Tennessee, at Milwaukee Irish Fest Summer School and at Boston College's famed Gaelic Roots. 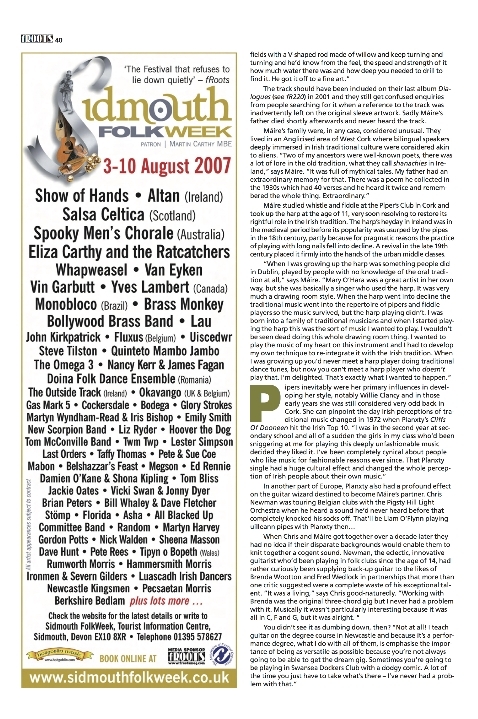 Being called “Virtuosic, fascinating, dramatic, original, inspired, gloriously adventurous, dazzling, brilliant, stunning, impassioned, electrifying, bewitching, moving, achingly beautiful, influential, revered, unique...” by well-respected media such as The Times, The Daily Telegraph, The Guardian, The Irish Times, The Scotsman, and Folk Roots, or “the most interesting and original player of the Irish harp today” by the late Derek Bell—Northern Irish harpist virtuoso—should already speak enough of a musician. 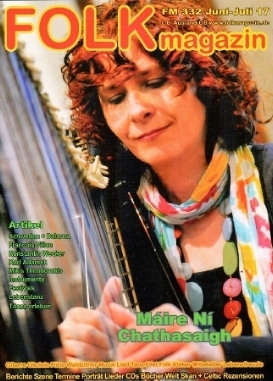 Máire Ni Chathasaigh is certainly one of Ireland’s most influential harpers of our time. Born 1956 in Cork City, Ireland, Máire was familiar with and interested in music since a very young age. She started from playing the piano at the age of six, the violin when she was ten, and finally the harp at the age of eleven. And having a self-conviction as a full-time professional harper in times like now—instead of any other ‘popular’ instrument—has certainly made her a true artist. 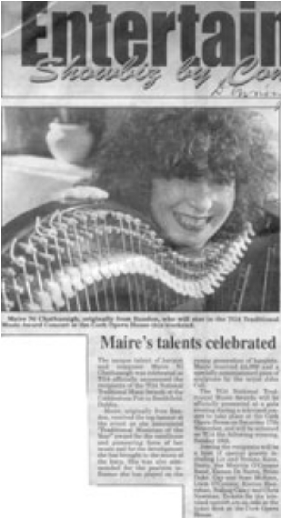 She also has earned recognitions such as won a first prize in All-Ireland and Pan-Celtic Harp Competitions on a number of occasions, and received Irish music's most prestigious award, that of Traditional Musician of the Year - Gradam Cheoil TG4 - "for the excellence and pioneering force of her music, the remarkable growth she has brought to the music of the harp and for the positive influence she has had on the young generation of harpers” in 2001. Now once again, we are proudly pleased to present you this interview session with one remarkable musician, yet a very humble woman. LTTW: First of all, we’d like to know a bit of your background. At what age did you get interested in (playing) music? And at what age do you decide that music is your thing? Máire: I can’t remember a time when I wasn’t interested in music. My mother tells me that I could sing before I could walk! I’ve therefore been singing since I was tiny. I started to play the piano when I was six, the violin when I was ten and the harp when I was eleven. Where did you have your musical training? I was fortunate to grow up playing both traditional Irish music and classical music in parallel – it has been a great advantage in life to have the ability both to learn by ear and to sight-read. My earliest musical training was provided by my mother. Traditional music education was provided within the family and through membership of the Cork Pipers’ Club. Classical music education on piano was provided by a private teacher, followed by teaching in the Cork Municipal School of Music. Good harp teaching was very hard to find outside of Dublin at that time, so I had to make do with rudimentary teaching from a lady who taught singing to harp accompaniment. 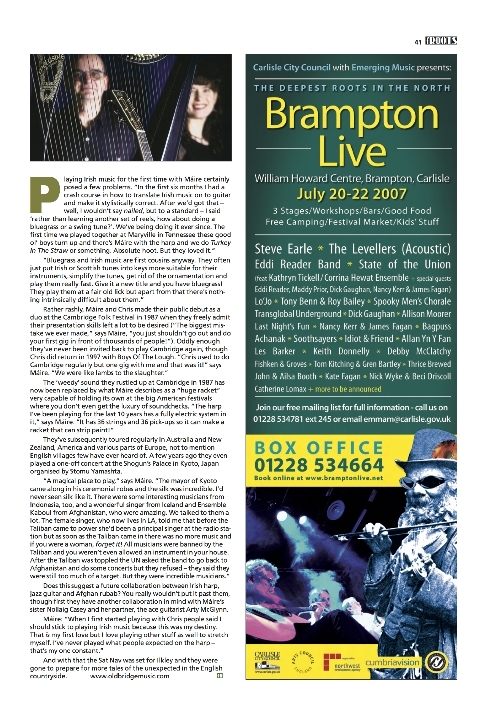 I wanted to be able to play traditional Irish dance music on the harp – tunes that I had been playing on the tin whistle and fiddle – so during my teens I developed the special techniques necessary to perform it in an authentic-sounding style, which I still use to this day. 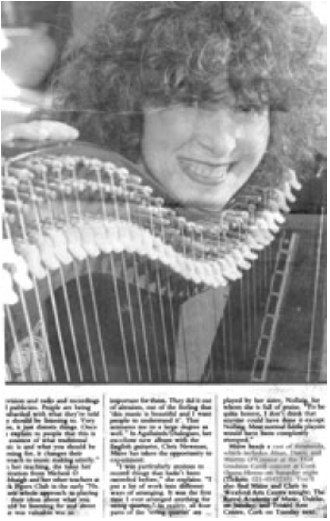 I didn’t get “proper” harp tuition until I was 21, when a wonderful pedal harpist called Denise Kelly came to Cork to teach at the SchoolMusic. The great grounding which she gave me in classical harping enabled me to refine and polish my approach to the traditional music I really wanted to play of. OK, now in the subject of Celtic music; Celtic music is found in many areas across Europe, from Spain, France, England, Wales, Scotland to Ireland. What is the common denominator(s) among them, and what are the unique features of each? Linguistically, the Celtic languages can be divided into two branches: P-Celtic and Q-Celtic. The languages currently spoken in Ireland and the Highlands of Scotland, and in the past in the Isle of Man, belong to the Q-Celtic branch and are closely related. Welsh, Cornish and Breton belong to the P-Celtic branch and are closely related. Though there would be no mutual comprehension between the speakers of Irish and Welsh, for example, the languages when examined are similar in grammar and syntax. 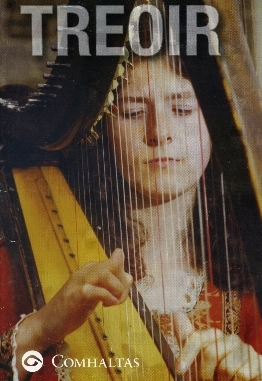 The civilisation of medieval Wales was however similar to that of Ireland in social organisation, literature, myth and legend and in the primacy of the harp in musical expression. So, strictly speaking, one can speak of Pan-Celtic language, culture, civilisation, art – but not of a Pan-Celtic musical language. What does Celtic music means to its people? And what does it mean to you personally? How different is the Celtic harp compare to other harps, physically? Does it require specific playing techniques as well? There isn’t really such a thing as a Celtic Harp, historically speaking. A very specific type of harp – usually referred to as the Ancient Irish Harp - was played in Ireland and Scotland for over a thousand years, until the beginning of the nineteenth century. It had several unique features: its forepillar had a pronounced curve and was T-shaped in section; its soundbox was hollowed out of one piece of solid willow attached to a soundboard; it was strung with brass and played with long nails; it was held on the left shoulder; the melody was played with the left hand and the accompaniment with the right; since it was very reverberant, the harpers used very complex stopping techniques to shape phrases. At the beginning of the nineteenth century, this harp was replaced by what is often called the Neo-Irish Harp. This looked superficially like the old Irish harp in that it had a curved forepillar, but it was constructed in a modern manner and played with the pads of the fingers and is the harp, with the addition of modern refinements, that we still play today. It is the harp people normally mean when they refer to the Celtic Harp. The Irish/Scottish harp in itself does not require specific performance techniques. However, the stylistically correct performance of Irish dance music does require the use of specific techniques. 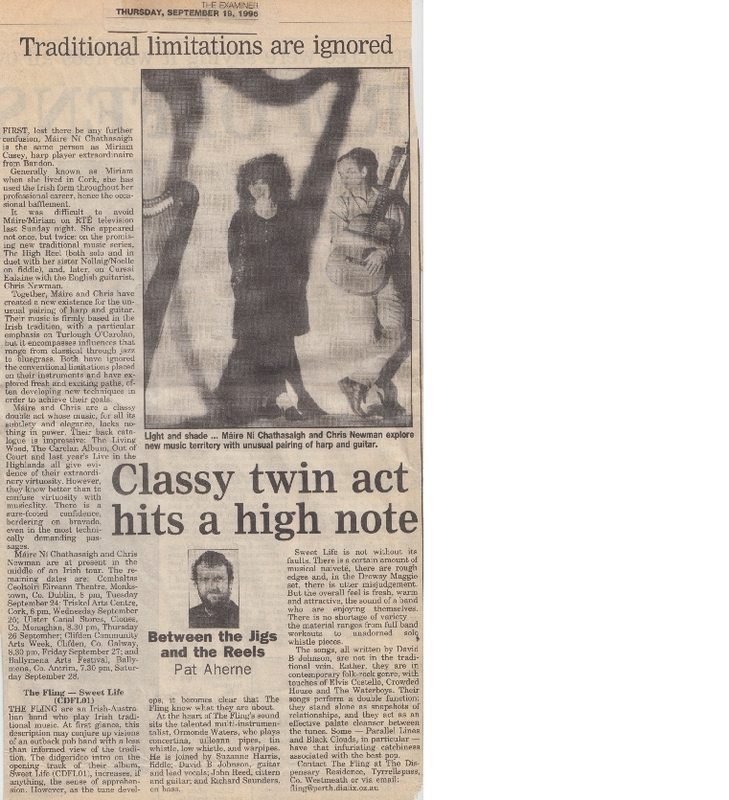 The techniques I developed for this purpose in the 1970s – there had hitherto been no tradition of dance music performance on the Irish harp - have since then been widely adopted and adapted. We must never accept the commodification of music. As artists we must make common cause with and draw strength from others with the same ethic and world view - and remember that the environmental movement was once considered to be hopelessly romantic and impractical! You have travelled distances to perform, and have had many chances in getting acquainted with music of other cultures. Are there any of them that inspire or impress you more than the others? And why? It’s great that you still remember Sacred Ryhthm Festival at the Nijo Castle in Kyoto. Would you join again if Sacred Bridge Foundation organized another cultural event?